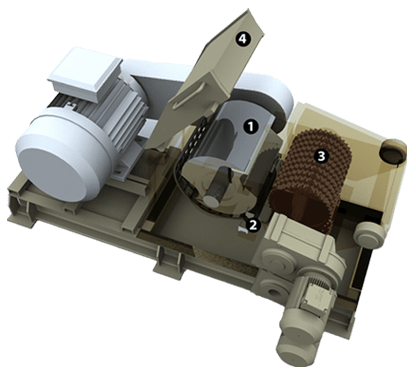 The HT series of drum chippers is the product of more than 25 years of experience in developing and manufacturing machinery related to wood waste reduction and utililization. The drum chipper is unique in its capability of processing solid wood slabs, rip edgings and cut offs into a uniform chip. [ 1 ] Rotor/knife: The rotor is a solid steel drum , precision machined to produce the requested chip size. The straight knives are mounted with a special wedge system that while utilizing the flyweel effect of the rotor , lock and secure the knives. [ 2 ] Counterknife: The counterknife support is divided into 2 parts; a stationary support locked in place, and a removable part to which the actual counterknife is mounted. [ 3 ] Infeed rollers: Machined and surface hardened ”pineapple style” infeed rollers stop when the rotor reaches its maximum load. As the load decreases, the feed works starts up again. This start/stop sequence eliminates overloads of the rotor. [ 4 ] The rugged, heavy duty main frame and rotor along with the chrome nickel shaft and oversized roller bearings, are engineered to accomodate the heavy shock loads typical of drum chippers.